The LUVERNE 2" tubular grille guard starts with Luverne's classic center section. The horizontal tubes are contoured to create their signature logo reveal, showing off your badge with pride. The tubes also add extra protection for your vehicle's grille and increased structural support. The frame-mounted uprights provide a solid structural base and are shielded with extruded rubber covers to better protect the finish. We also add a polished stainless steel backing to the uprights, giving them a clean, finished appearance that will outlast rust and the elements. 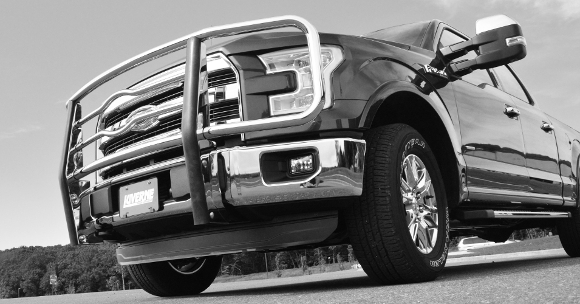 To add some beef to the front end of your vehicle, the LUVERNE 2" tubular grille guard is built American-tough. They construct it from high-strength steel, right here in the USA to ensure the utmost quality. To finish off the LUVERNE 2" tubular grille guard and truly make it an accessory fit for your vehicle, Luverne makes each one vehicle-specific. This means no frame drilling necessary during the install and compatibility with your factory tow hooks on most models. 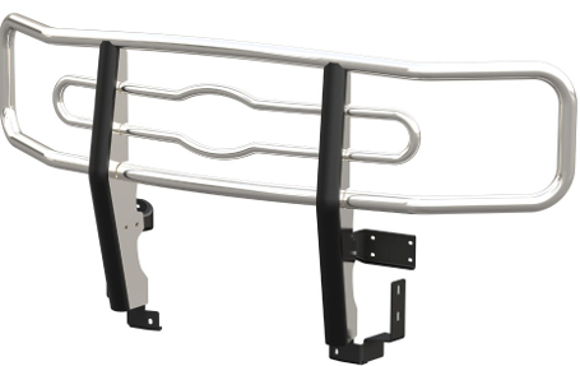 The grille guard mounts directly to your vehicle's frame using strong steel mounting brackets, and the brackets are covered in a black powder coat finish to ensure long-lasting durability. The grille guard also features vehicle-specific side brush guards that are bent to frame and protect your headlights.